In one of the Part 3 on evangelism defintions, we looked a little at the distinction between actions and words in evangelsim. 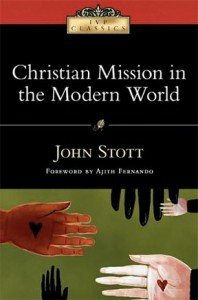 John Stott speaks a little on social action and evangelism in this now classic book: Christian Mission in the Modern World (IVP Classics). The 1975 Chavasse Lectures were given by John Stott to a packed audience (and an overflow as well) drawn from the university of the city as well as from Wycliffe Hall itself. All Christians everywhere, whatever their cultural background or theological persuasion, must think at some time or other about the relation between the church and the world. Here is an excellent three points brought out at at Timmy Brister’s blog. “In this case evangelism and the winning of converts are the primary ends in view, but social action is a useful preliminary, an effective means to these ends. In its most blatant form this makes social work (whether food, medicine, or education) the sugar on the pill, the bait on the hook, while in its best form it gives to the gospel a credibility it would lack otherwise lack. In either case the smell of hypocrisy hangs round our philanthropy. A frankly ulterior motive impels us to engage in it. And the result of making our social programme the means to another end is that we breed so-called ‘rice Christians.’ This is inevitable if we ourselves have been ‘rice evangelists.’ They caught the deception from us.” (26). “In this case philanthrophy is not attached to evangelism rather artificially from the outside, but grows out of it as its natural expression. One might almost say that social action becomes the ‘sacrament’ of evangelism, for it makes the message significantly visible” (ibid.). “As partners the two belong to each other and yet are independent of each other. Each stands on its own feet in its own right alongside each other. Neither is a means to the other, or even a manifestation of the other. For each is and end in itself. Both are expressions of unfeigned love” (27). 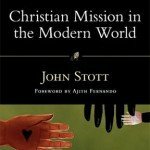 Stott explained that the Apostle John helped him come to this conclusion when he wrote, “If any one has the world’s goods and sees his brother in need, yet closes his heart against him, how does God’s love abide in him? Little children, let us not love in word or speech but in deed and in truth” (1 John 3:17, 18). He concludes with a little caveat. “This does not mean that words and works, evangelism and social action, are such inseparable partners that all of us must engage in both all the time. Situations vary, and so do Christian callings. As for situations, there will be times when a person’s eternal destiny is the most urgent consideration, for we must not forget that men without Christ are perishing. But there will certainly be other times when a person’s material need is so pressing that he would not be able to hear the gospel if we shared it with him. The man who fell among robbers needed above all else at that moment oil and bandages for his wounds, not evangelistic tracts in his pockets! Similarly, in the words of a missionary in Nairobi quoted by Bishop John Taylor, ‘a hungry man has no ears’. If our enemy is hungry, our biblical mandate is not to evangelize him but to feed him (Romans 12:20)! Then too there is a diversity of Christian callings, and every Christian should be faithful to his own calling” (28). Just food for thought . . . .
Order your copy of Christian Mission in the Modern World (IVP Classics) at Amazon.